Athens, GA (Mar 9, 2008) - If one were to attend a big football or basketball game at the University of Georgia, it would not be unusual to see a news truck from another television market near Sanford Stadium or Stegeman Coliseum. It is unusual to see one somewhere else in town on a Sunday afternoon, especially when it is from WRAL in Raleigh North Carolina. The truck was sitting at the corner of Dougherty and Lumpkin Streets this afternoon. Sadly, the reason it was here was for the funeral of Eve Carson, the 22 year-old President of the University of North Carolina, who was tragically shot to death in a carjacking last week in Chapel Hill, NC. 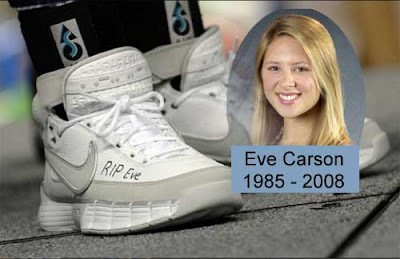 A University of North Carolina Women's Basketball player remembers Eve Carson on her sneaker. For all the reasons that UNC fans had to celebrate this weekend, with the women's team winning the ACC Championship and the men's team beating Duke, the tragic loss of this unique student casts a pall on both of these things. As it should. Basketball players come and go, and championships are fleeting. The loss of an extaordinary, and I mean EXTRAORDINARY, student and human being is much more meaningful than a trophy or a championship. She came to Carolina in the fall of 2004 as the recipient of a prestigious Morehead Scholarship. A member of the Phi Beta Kappa honor society, she was a pre-medicine student majoring in both political science and biology. As a North Carolina Fellow, she was part of a four-year leadership development program for undergraduates. While at UNC-Chapel Hill, she was extremely active in both leadership and service roles. As student body president, she was also a member of the UNC-Chapel Hill Board of Trustees. She served as co-president of the Honors Program Student Executive Board and as a member of the Committee on Scholarships, Awards and Student Aide; the Academic Advising Program; and the Chancellor’s committee for University Teaching Awards. Teaching and working with children were key service interests for Eve. In 2006, she taught science at Frank Porter Graham Elementary School in Chapel Hill as part of UNC’s INSPIRE program, whose mission is to encourage young students to pursue science as an interest. In her junior year, Carson was a tutor at Githens Middle School in Durham. She was also an assistant coach in the Girls on the Run of the Triangle, a character development program for girls ages 8-12 that uses running to teach values and a sense of self. Eve's service extended well beyond the Triangle, however. In the spring of her sophomore year, she participated in a study abroad in Havana, Cuba, and she spent her summers working and volunteering in Ecuador, Egypt and Ghana as part of the Morehead Summer Enrichment program. "I credit my prior experiences, especially my past two Morehead summers, for preparing me to get along with pretty much whatever comes my way," she wrote in an e-mail posted on the Morehead Web site. On campus, she became involved in Nourish International, an organization started by UNC students in 2002 for hunger relief. Eve served as freshman volunteer coordinator (2004) and co-chair (2005) for the group. While her funeral was at First United Methodist Church in Athens today, she was remembered throughout the Athens community this weekend. Hundreds showed up for a memorial service at Clarke Central High School the other day. At St. Joseph Catholic Church in Athens, the 6:00 PM Sunday Mass was offered in her memory. University of North Carolina men's basketball players bow their heads in a moment of silence for Eve Carson before last night's game against Duke. Perhaps it is fitting that today's Gospel at St. Joseph was the story of Lazarus from the Gospel of John. It is this Gospel that gives the words "Jesus wept." Students, friends and family are weeping for their lost daughter, sister and friend. But they can take comfort that she touched many lives in her life that was tragically cut short. That legacy is worth much more than any championship or victory on a basketball court or a field of play. This is not a day about sports in Chapel Hill or Athens. It is a day to remember the life and spirit of a true gift to everyone that Eve Carson touched in her life.